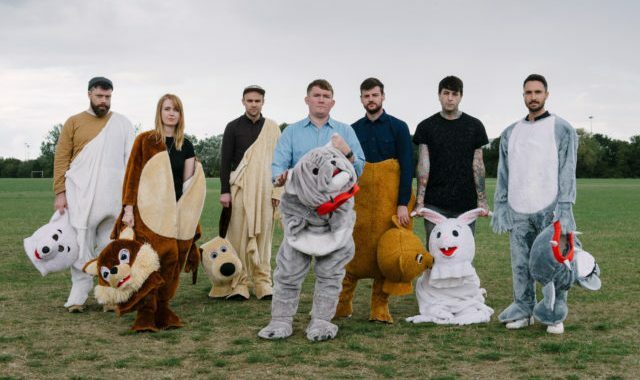 On the 16th of January, UK indie heroes Los Campesinos! released the second single, “5 Flucloxaillin”, from their up-coming full length album, Sick Scenes. … and oh how Los Camp have delivered! “5 Flucloxaillin” picks ups where exactly No Blues left off. The single is indie-pop at its pinnacle. Improved production is immediately noticeable; the mix is full and sonically rich with piano, both acoustic and electric guitar, as well as a driving bass and drums combo. The vocals are built up in the classic Los Campesinos! style, with Gareth’s emotive and energetic story telling backed up by beautiful harmonies. The lyrical content of self-medication is hard-hitting, yet uplifting and hopeful in the tired and tested Los Campesinos! formula: “They say if they had got the victory/ Well I guess we’ll never know!” This a song that I’m going to be dancing to all year, and one that has absolutely renewed my excitement for “Sick Scenes”. Roll on February the 24th, and roll on the UK tour! “5 Flucloxaillin” is currently streaming on Sterogum. Sick Scenes will be released on the 24th of February on Wichita Records. Posted in News, Record Reviews and tagged 5 Flucloxaillin, Amarante, indie, Los Campesinos, Review, Sick Scenes, single.